Q: Who are the Take Note Singers? A: The Take Note Singers are just ordinary men and women who love singing. They love getting-together with other like-minded people and singing for the pleasure of it! Q: How many singing groups are there? A: We run six groups around the wider Wellington region. Groups cover the Hutt, Porirua and the Kapiti Coast areas. Q: Do I have to be a trained singer to join? A: Definitely not. The only prerequisite is that you enjoy singing. Q: Do you have to audition to join one of the groups? A: There are NO AUDITIONS. Anyone who wants to sing is welcome to join with us. Q: If you want to join, do you have to commit to a year? A: Not at all. You pay on a per term basis and can stop or start up again whenever it suits you. Q: If you miss a session, can you attend one of the other groups to catch up? A: Yes you can! All the groups are doing the same songs, so you are welcome to catch up on any missed sessions at any of the other groups. Q: Why is the group called the Take Note Singers and not a choir? A: The word 'choir' conjures up images of very hardworking groups of serious people - we are nothing like that! We are very happy groups who share many laughs through our sessions, and we never take ourselves too seriously. Yet the sounds we create are amazing! Q: Do you ever do performances or concerts? A: Yes. The groups do at least one performance each term - sometimes a performance in the area where the group is based and other times all the groups join together to perform! Which is so much fun!!! 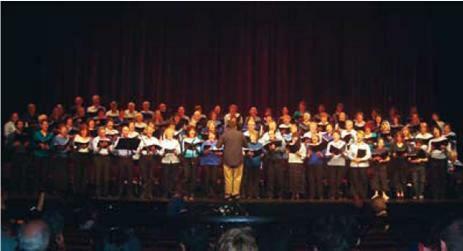 We sing in community concerts, perform in malls, hospitals and many other public places - we've even sung at Wellington Railway Station and Wellington Airport, and even been featured on TV1's Good Morning Show. Q: Do you have to sing in the concerts? A: No. While most people do sing in our performances, this is not a requirement. Quite a few people only ever attend the sessions - and that's fine. Q: Can I come along and try a session? A: Most definitely. Anyone is welcome to come along for two no-obligation sessions. If you like what you hear and see, you can join up on the spot. If it's not what you're looking for, then there is no pressure to join. Q: Do you have to pay for your two no-obligation sessions? A: If you decide to join up after having your two no-obligation sessions, then you do need to pay for your no-obligation sessions. You just pay the normal term fee of $70 per term or $35 per half-term. If you decide not to join up, then there is no charge for your two no-obligation sessions. Q: Can I bring along a friend? A: We have had singers aged from 10 years to 85 years who have sung regularly with us. Whatever your age, you are welcome to give it a go. Q: Are you ever likely to open groups in other cities? A: If there are enthusiastic people who would be interested in starting up a Take Note Singers group in their area, then you are welcome to contact David Dell to discuss the options.